Last minute camping trips? Too many things to do? Not enough time to get ready to leave? Can't find everything? After several unorganized attempts to pack for camping trips, I discovered that having a "Ready-To-Go" Cook Box helps to make getting ready for vacations and weekend camping trips much easier. Having all of the 'kitchen' supplies in one handy, heavy-duty plastic crate on the closet shelf with much of our other camping equipment means that I usually have everything that we need in one place, and we don't have to buy more of the forgotten items left at home. I keep a checklist with the cook box as a helpful reminder of what things to add that we don't keep in the cook box. This idea is easy to customize for other uses, too - kids' travel toy box, games & electronics for long road trips, beach towels, toys & sunscreen - all within easy reach when it's time to leave for the day or a trip! A sturdy milk crate makes a good box here. They stack nicely, can take a beating, and they allow air to pass through which prevents mold. I've seen others use trunks or larger, Tupperware containers - it's really up to you! Here's a list of things I like to have on hand. Any other must-haves you've discovered? Leave them in the comments! Garbage bags, and a heavy duty clip, large enough to attach it to the table. 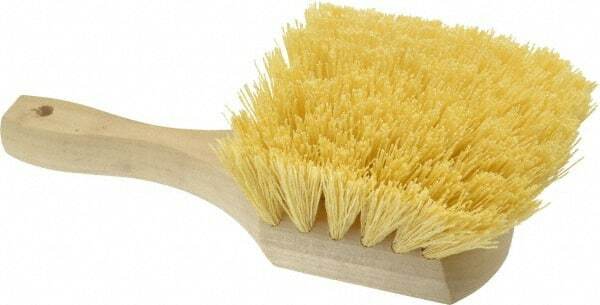 I like to use a large handled utility scrub brush for doing the dishes. Although you mentioned a lantern, a headlamp is also very handy as it gives directed light, and leaves your hands free, maybe that belongs in another to-go box? How about spare batteries for the lantern? Great suggestions, Poppy 19. This past fall on a 3-week camping trip, I did take a small plastic cutting board and used it often for a variety of chores. I also used a headlamp which really came in handy since we were camping in remote Canadian locations. This box will make carrying all our cooking gear to the various places we camp, much easier because we can just take it out of the car and its "ready to go". A bonus is being able to find what you need easily. We've used the 'ready to go' box for years, 13voltbattery, and it makes both getting ready for trips and unpacking when we get home so much easier; you're right, too -- it is easy to find everything when you need it. Great idea. I have something similar with my camping supplies. It really does make camping a lot easier. Thanks, seamster. I'd like to see a photo of how you carry your camping supplies, if you can post one. We keep all of our camping cooking stuff in a rubbermaid container. Small drawstring bags hold plates, silverware, and cooking utensils. Thanks for posting the photo, seamster.